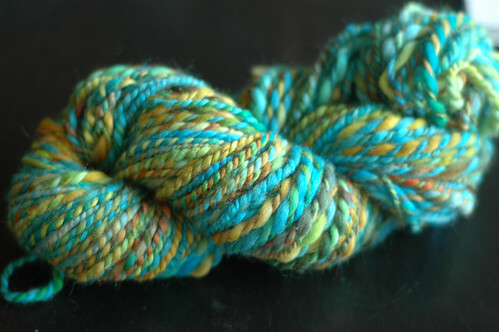 So a few weeks back, I was bemoaning to Carrie/Big Alice that I couldn't find the perfect orange and turquoise roving. 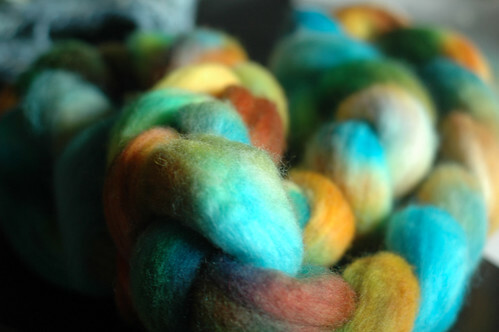 She's been playing around with dyeing roving (in addition to her super pretty yarn...which I assume will be available in her etsy shop eventually) and volunteered to give it a whirl if I'd test it out and see how it spun up. Yeah, pretty awesome, right? That's like asking me to "test this batch of delicious homemade cookies." So. Pretty. I squealed a little when I saw it. Yum!! It's BFL, which I'm rapidly discovering is very enjoyable to spin. It came out super squooshy, which is awesome- I'm not quite good enough at spinning to make things come out squooshy unless they want to do it all by themselves. Hooray!! I'll take another picture once I knit it up into something...but I should probably show Carrie the end result first. Heh. Thank you thank you thank you Carrie!!!! ohhhhhh I so love these colours, lucky you for sure. I can't wait to see what you make with it. Hurry hurry. lol.